R.S.V.P. 's with confirmed attendance receive a complimentary one-year subscription to Time Out Chicago Magazine! Manchester's global party embassador, Trus'me comes to Chicago, bringing together the past, present and future of forward thinking music. Disco 3000 is a global music brand concept conceived of by Manchester DJ and producer Trus’me to showcase his widely varied musical styles in an International forum. Bringing together like-minded DJ compatriots around the globe, D3K now has homes (a.k.a. party residencies) in Manchester, London—at famed super club Fabric, New York—at A-list lounge APT, Guadalajara Mexico… and now in CHICAGO, where it is launching a new quarterly series starting in September. An increasingly successful International party, D3K showcases forward thinking music from today while also tracing back the roots of what brought us here. Our goal is to connect the dots between the past, present and future and have a raging good time while doing it. With nothing more than good music at its core—be it house, techno, disco, boogie, funk or soul—D3K is pleased to announce the latest addition to its growing network of forward thinking DJ nights. 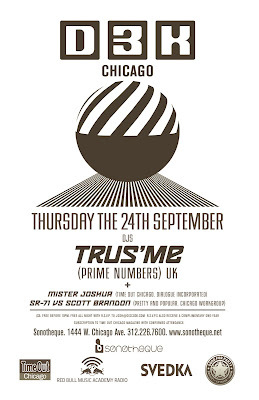 Taking place quarterly in the Ukrainian Village’s hottest DJ lounge, Sonotheque (1444 W. Chicago Ave. 312.226.7600) and helmed by Mancunian selector Trus’me—the man behind the brand and increasingly prominent record label, Prime Numbers—D3K is also pleased to announce the inclusion of Time Out Chicago Nightlife editor and long-time tastemaker Mister Joshua P. Ferguson. For each edition of D3K:CHI there will also be featured local DJ celebrities from a variety of club backgrounds. Event kicks off September 24, 2009. To help promote our launch the party is free all night to those who RSVP and before 10-pm to those who do not. While the musical talent is without a doubt the focus for the evening, we are pleased to announce a few added amenities beyond our esteemed selectors. SVEDKA Vodka will be on hand all night so that patrons can enjoy an exclusive menu of specially priced SVEDKA cocktails. We’re also pleased to announce that Time Out Chicago is our media sponsor for the night, so everyone that RSVP’s to josh@disco3k.com and attends the event will be given a complimentary one-year subscription to the magazine, an invaluable source for all noteworthy happenings in the our Windy City. Red Bull Music Academy Radio will also be in the building, broadcasting the entire event LIVE. The musical content will also be available after the show for interested bloggers and media types to rehost via their websites. All in all, DISCO3K | CHICAGO is shaping up to be the first of many nights to remember over the course of 2009 and 2010. FREE admission all night with RSVP to: josh@disco3k.com All RSVP’s receive a free year subscription to Time Out Chicago Magazine. $5 after 10pm for non-RSVP guests.